Eelco Ferwerda (OAPEN), Lucy Montgomery (Knowledge Unlatched Research), and Christina Emery (Springer Nature) recently joined OASPA and Knowledge Exchange for a webinar to discuss new developments in Open Access monographs in the humanities and social sciences. Jeroen Sondervan (Knowledge Exchange) chaired the discussion. The Copyright Clearance Center hosted the webinar. Leyla Williams, Events and Communications Coordinator at OASPA, reflects on the discussion. Opening our joint webinar with Knowledge Exchange on the afternoon of Thursday 14th December 2017, chair Jeroen Sondervan welcomed speakers and listeners by giving a brief introduction to the recent history of Open Access monographs in the humanities and social sciences. The possibilities and feasibilities of monograph publishing were first explored by various parties – including the European Union – around ten years ago, which was followed by the development of archiving and discovery services by organisations such as OAPEN.org and the Directory of Open Access Books (DOAB). Today, according to the DOAB, there are over 240 publishers experimenting with Open Access Monographs. Ferwerda pointed out the striking diversity in the countries explored in the study; while all European, wealthy within a global context, and generally supportive of Open Access, they differ widely in population and market size, in their support for book publishing, funding opportunities, policies around Open Access, and their range of publishers within countries. Policy-wise, Ferwerda explained, Austria is the only country studied with a clear Open Access policy around books, working with a mandate from the Austrian Science Fund. The Netherlands and the UK also have strong Open Access policies, with both still deliberating how to move forward with policies around Open Access books. With regards to funding, Austria again was shown to have the strongest opportunities; all Austrian-based researchers have access to funding for Open Access books and monographs. In contrast, the UK’s strength can be seen in its book publishing market; publishers like UCL Press and Open Book Publishers, continued Ferwerda, are making their mark, and a number of new initiatives like Knowledge Unlatched and Ubiquity Press reveal the innovation happening within the country. The Dutch publishing industry, publishing almost entirely in English, is likewise highly focused on the international market, and was an early adopter of Open Access books. Germany revealed itself as publishing more Open Access books than any other country in the study, given its strong market, early adoption of university presses, and requirement for PhD students to publish their theses, which has lead to an abundance of publishers. All in all, argued Ferwerda, a variety of publishing models and approaches to Open Access are needed to enable the successful transition to Open Access books; no single model fits all. To support this transition, re-routing existing funds, improving discoverability, making authors aware of the benefits of Open Access, and having the support of libraries, is vital. Our next speaker was Lucy Montgomery, who walked us through two recent studies on Open Access monograph usage data: Exploring the Uses of OA Books via the JSTOR Platform, and Getting the Best out of Usage Data for Small OA Monograph Presses. The first, commissioned and funded by four university presses – UCL, Michigan, Cornell, and California – came about thanks to these presses noticing that usage of Open Access books made available by JSTOR was far in excess of usage that each publisher had previously recorded through other distribution channels, and wanted to understand more about how their Open Access content was being used. Data collected by JSTOR between August 2015 and August 2017, along with publisher questionnaires and interviews, revealed that usage of Open Access books exceeds usage of gated Open Access books by the same publisher on JSTOR. This became particularly clear, explained Montgomery, when the researchers considered each publisher’s downloads according to license type; Open Access book chapters account for those publishers making books available both Open Access and gated via the JSTOR platform. Montgomery continued by explaining that the next aspect of the study looked to understand where readers were coming from online. For all publishers, the JSTOR platform accounted for the largest number of referrals to Open Access books, followed by Google Scholar and Google. Location-wise, a very large proportion of readers downloading Open Access books – 42% – were based in the United States, with 6.8% in the UK and 4% in Canada and India. Relative to academic population size, however, the Philippines emerged as having the highest number of users of Open Access books, followed by Uzbekistan and Bosnia and Herzegovina. Looking to explore how people use books on the JSTOR account, moreover, the study found more than 90% of readers download just one or two chapters of a book per session; close to 80% of readers download just a single chapter. For Montgomery, the take-home messages of the study were of the power of platforms like JSTOR for enabling the usage of Open Access books; the geographic diversity of those making use of Open Access books, with a relatively high proportion of users based in the Global South; and that there is an incredibly large and rich amount of data on the uses of Open Access books available via the JSTOR platform for publishers strategizing around content development and marketing. The second study, Montgomery continued, was a collaboration between UCL Press, Knowledge Unlatched Research, and the Center for Culture and Technology at Curtin University, and explored usage data for small Open Access monograph presses by conducting a case study of UCL Press. Small Open Access monograph publishers, the study found, face a number of challenges in the way of resource constraints and a lack of in-house expertise, but they do already have an abundance of data that can provide them highly useful strategic information, such as how well particular titles are doing and which promotion strategies are most effective. This usage data can be better made use of by these presses; this might include provision of guidance to staff on best practices around social media promotion or how to engage with new and ongoing community initiatives such as OPERAS-D and HIRMEOS. Our final speaker, Christina Emery, explored for us the findings of Springer Nature’s recent white paper, The OA Effect: How does Open Access affect the usage of scholarly books? A mixed qualitative and quantitative study, the study benchmarked Open Access book metrics against those of equivalent non-Open Access books, as well as conducting interviews with authors and funders to understand their experiences of the effect of Open Access on books. Springer Nature found that, on average, there were just under 30,000 chapter downloads per Open Access book within the first year of publication, which was seven times more than the average non-Open Access book. Citations, moreover, were 50% higher for Open Access books than non-Open Access books over a four year period; an Open Access book is cited on average twelve times within the first four years of its life, as compared with eight times for a non-Open Access book. While the research didn’t find a correlation between downloads and citations, a trend was identified: books are usually downloaded within the first year of publication, while citations ‘build up over time’ – older books tend to see higher numbers of citations. Open Access books, Emery continued, are mentioned on average ten times more than non-Open Access books in the first three years after publication. Emery pointed out the various limitations of the study – there may have been a self-selection bias among authors who choose to publish Open Access books, and different reputations of institutions and authors and inequality of access to APC funding may affect whether a book is published via the Open Access route. Moreover, the study was observational in nature; it didn’t seek to explore the direct impact of Open Access. But despite these limitations, Emery described the study’s holistic approach to understanding Open Access books as an important one in moving beyond simply quantitative measures, and as revealing a positive effect of Open Access on books, with the data exceeding Springer Nature’s previous expectations of the effect of Open Access. With the study showing that authors and funders feel uninformed about these effects, Emery argued there is still more work to be done to improve education around the benefits of Open Access – and broadening the scope of this study in the future by repeating the analysis over a longer period, or assessing causation between Open Access and a book’s performance, might be one useful method. Moving into a panel discussion, the speakers answered questions from webinar listeners. Panel chair Jeroen Sondervan began by commenting that quantitative studies on open access usage and metrics benefit hugely from open, verifiable data in order to benchmark and make comparisons, but noted that until recently, these studies have been scarce. In answer to his question of whether panelists had ideas on how to persuade publishers to open their user statistics, Ferwerda cited HIRMEOS as encouraging the sharing of usage data amongst different platforms, using a common functionality to collect and present this data. In the future, this may also include the collection of data from repositories and platforms such as JSTOR. Emery added that there is no standardisation for measuring impact; different publishers track full book downloads or chapter downloads and/or page views, and argued that more collaboration is needed in considering what kinds of starting points publishers can work from in collecting data. Montgomery pointed out that the challenge of benchmarking is not necessarily the same for different presses, and that researchers could consider which kind of (non-standardised) data is already available for analysis, and consider new ways of approaching this data. Asked if her study included looking at the effect of a book being made available Open Access had on print sales of the same book, since scholars might still buy the print version if an Open Access version is available, Emery answered that more Open Access book downloads can lead to more print sales, but that more research needs to be conducted on this. Ferwerda, answering a question around whether challenges within open access book and monograph publishing present themselves differently in different disciplines, commented that with regards to funding, while most monographs are published within the humanities, most books being funded by the Wellcome Trust are on subjects such as medical history. Noting the importance of considering researchers and authors, Emery added that different motivations correlate with different subject areas within research; the reasons why different authors might publish Open Access books differ widely. 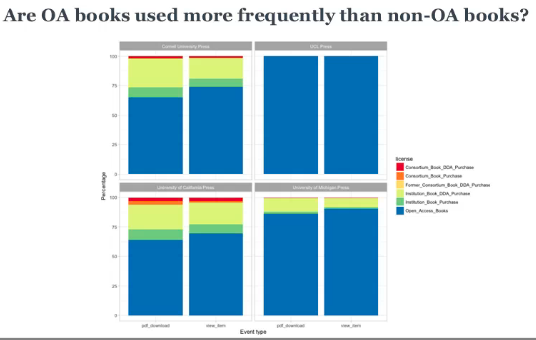 Montgomery further commented that, in her study, subject-specific downloads were analysed and the most popular subject classifications within downloaded Open Access books were quite distinct from the most popular subject classifications within downloaded gated books. Panelists were also asked to consider the transparency of APC costing and their ideas on the current BPC market and its ‘non-transparency.’ Ferwerda reflected that Open Access book publishers are still finding their way within the scholarly publishing landscape and the services they’re providing to authors, and that it’s perhaps too early to point fingers at publishers still experiencing a steep learning curve. Asked where they see the Open Access book and monograph publishing landscape in five years time, Emery responded that while she thinks we’ll still see it in an experimental phase, alternative business models will be more established. There’s no one route to Open Access, she noted, but continuing a collaborative approach to solutions and challenges within publishing will be beneficial for all. Montgomery answered that given the time and effort it’s taken to get Open Access monographs this far, five years seems like a close horizon; like Emery, she hoped we will still see experimentation and innovation among publishers, and that diversity can continue to be maintained. 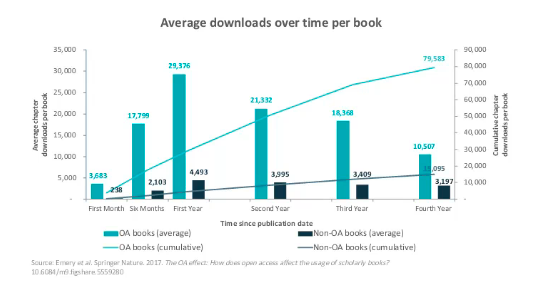 Ferwerda added that the number of books in DOAB has increased by 50% year on year since its launch, arguing that this large Open Access books growth is likely to continue. Wrapping up the webinar, panelists reflected on innovators within open access books and monographs publishing. Ferwerda cited Open Book Publishers and Open Humanities Press as early innovators with new models, and Language Science Press as an excellent example of a community-driven press. Montgomery pointed to Ferwerda for creating an important infrastructure for Open Access books with DOAB, making it possible for other Open Access monograph publishing initiatives to emerge. Emery added that Frances Pinter has does a tremendous amount for Open Access books through the launches of Knowledge Unlatched and KU Research, and finding funding for important research projects. The recording of this webinar, along with the accompanying slides from the discussion, is freely available for the public and can be found here.